I recently attended an intimate gathering that featured a tour of the UCLA Infrared Lab. We were treated to a private overview of the lab’s current research by Professor Ian McLean who heads up the lab. I had the opportunity to see first-hand the manner in which the researchers work on some very cutting-edge technology. 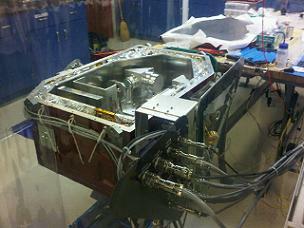 Take for example the work-in-progress Gemini Planet Imager (see inset photo), a near-infrared AO coronographic high contrast imaging system designed for detection of extra-solar planets. The camera is scheduled for delivery this year to the Gemini South Telescope on the summit of Cerro Pachon in Chile. Later in the evening Dr. McLean delivered an excellent talk entitled “Lifting the Cosmic Veil: The Story of the Infrared Lab Group.” I learned a lot from this in-depth treatment of the history of infrared astronomy and the UCLA group’s significant contributions. I found out that the group built a number of important infrared devices for the Keck Observatory such as NIRSPEC, NIRC2, OSIRIS, and is working on the MOSFIRE spectrometer and FLITECAM for the SOFIA in-flight telescope mission. The group also plans to construct the IRIS infrared imaging spectrograph for the upcoming Thirty Meter Telescope project. After McLean’s talk, UCLA’s Dean of Physical Sciences, Joseph Rudnick gave a very encouraging summary of the accomplishments of the infrared group and its high stature today, as well as the university’s desire to maintain their leading position. During the reception that followed I had a chance to talk at length with Professor McLean to get a closer view of his group’s research. I gleaned much from this discussion and I walked away with the feeling that I will closely follow the group’s research directions in the future.